Professor Patiño holds a Master of Business Administration in General and Strategic Management from Maastricht School of Management, The Netherlands. He also holds a Masters degree in Strategic Business Administration, Pontificia Universidad Catolica del Perú. 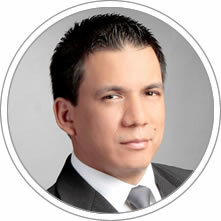 He holds an undergraduate degree in Industrial Engineering from Pontificia Universidad Católica del Perú. Professor Patiño is a specialist in indicators management and improvement, as well as in the use of quantitative tools and models. He has been the Project Manager at the Planning and Retail Finance Management division at the Ripley group. He has developed several projects related to the improvement of processes with Lean-Six Sigma methodology, process efficiency, change strategies for the optimization of resources, and the improvement of customer service at Banco de Credito del Peru. He has worked at the treasury and foreign trade division at Backus y Johnston Company. He has more than ten years of teaching experience and he is an independent consultant. Professor Patiño currently is the Branding Manager of sports betting and fast games at Intralot company, and a Professor at the Operations, Logistics and ICT Department at CENTRUM Católica Graduate Business School.